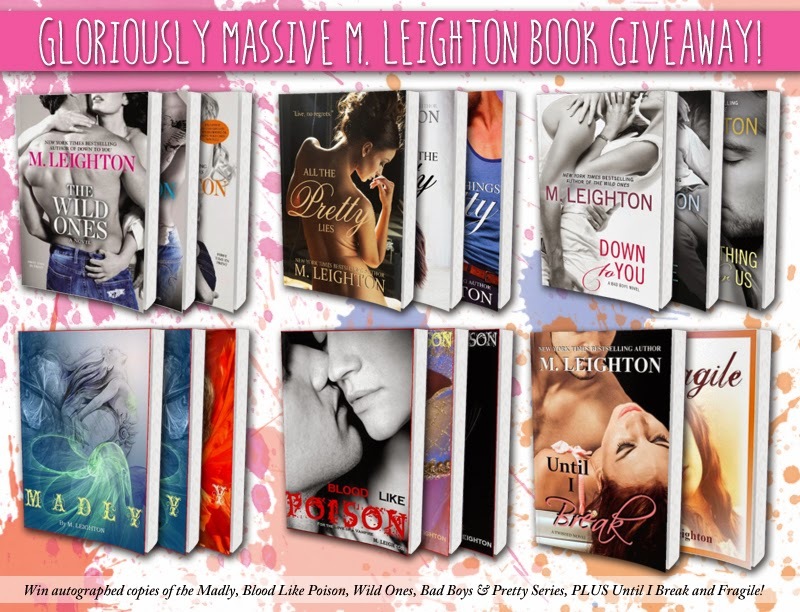 M. Leighton Books: Facebook changes, where to find me and a GLORIOUSLY MASSIVE GIVEAWAY! Facebook changes, where to find me and a GLORIOUSLY MASSIVE GIVEAWAY! With 2015, there will be some very significant changes to Facebook. Many of you have probably already heard the rumblings, but few of you will be affected. It's mostly those who use Facebook for their business that will be hit hard. Those people like authors and small business owners, entrepreneurs and most artists. I am one of those people. I fall into all of those categories. Starting in January, things that I post to my author page will no longer reach you in any kind of reliable, predictable way. We will be expected to boost our posts, which costs money and STILL isn't nearly as effective as the good old days when you liked a page and then could see those posts. So, in an effort to retain contact with you, I'm urging you to pleasepleaseplease follow me here on my blog, on Twitter and Instagram, Tsu and Goodreads and, most importantly, to sign up for my newsletter. As a thank you, I'm doing a giveaway that's exclusive to you, my wonderful readers. Up for grabs will be a SIGNED PAPERBACK COLLECTION of my Bad Boys series, my Wild Ones series, my Pretty series, my Madly series, my Blood Like Poison series, Fragile and the hard-to-find Until I Break. To be entered to win, all you have to do is sign up for my newsletter. You get 5 points in the Rafflecopter Giveaway for subscribing, but you can increase your odds of winning by following me on Instagram (3 points) and following me on Twitter (2 points). If you're already subscribed or following me, you're still in luck! Just list your email address for your subscription and your Instagram and twitter names for confirmation of following and you'll still get the extra points:) Technology is so awesome sometimes, isn't it? I really hope that you'll do all three of those options because while the newsletter is a great way for me to get information to you, it's harder for us to actually interact, which y'all know I LOVE doing. It has inspired me and encouraged me, made me laugh, made me cry, made me hang on and keep keeping on when I worried that I couldn't. I VALUE you! So please, look me up on Twitter and Instagram! Hearing from you makes me happier than you know. I'll draw a winner on January 12th at midnight and announce it here on my blog (as well as post it on the Rafflecopter), so keep an eye out!